The First World War ushered in the age of the aircraft fighter. The fighters of that era were crude by modern standards, but the lessons learned in the air over Europe paved the way for what would become our modern fighter aircraft. 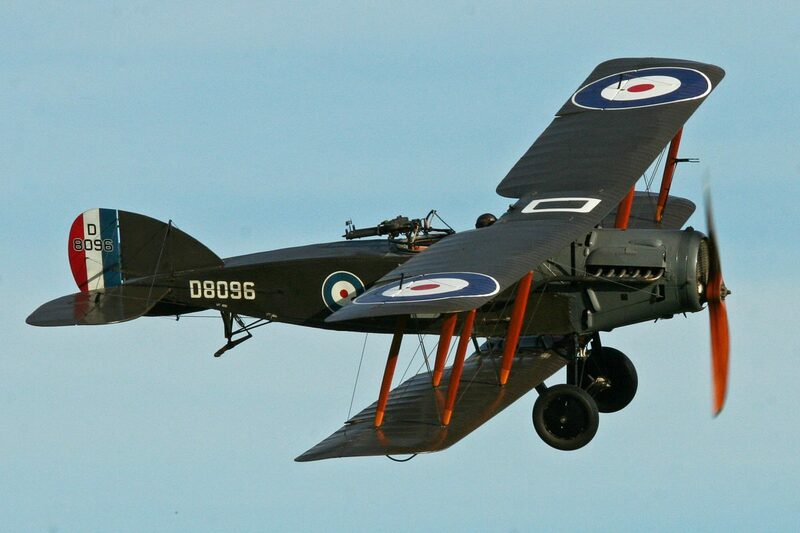 The Bristol F2B Fighter served in World War One in both combat and reconnaissance roles. Developed by the Bristol Aeroplane Company in 1916, it was a two-seater as opposed to the more common one-seater aircraft. This enabled the aircraft to have one synchronized, forward-firing Vickers machine gun and a second Lewis Gun mounted on the rear cockpit which was operated by the airman in the second seat. What could be called the “prototype” of the F2B, the F2A, went into production in early 1916, but only 52 were made before production switched to the F2B, which had a more powerful engine capable of speeds 10 mph faster than the F2A and could subsequently reach 10,000 feet three minutes faster. The F2A was used on the Western Front in April of 1917 at the Battle of Arras. There were high casualties during this battle, and two of the six F2A’s in the air were shot down and a fifth rendered unflyable. Despite the losses, the Bristol Fighter performed well overall against German aircraft, and in October, an order was placed for 1,600 F2B’s. At the end of the war, the Royal Air Force had a total of 1,583 F2B’s remaining. Over the next two decades, a total of 5,329 F2B’s would be made and put into service across what was then still the British Empire. This fighter became so popular that the United States Army Engineering Division developed plans to build an American version of the aircraft. Unfortunately, the team chose to power their version with a Liberty L-12 engine, which turned out to be too heavy and bulky for the aircraft. As a result, only 27 of these aircraft were ever built in the United States. The F2B would stay in service as far away as New Zealand until 1935. Today, there are only three known Bristol Fighters which remain airworthy. They can be found in the Shuttleworth Collection in England, the Canada Aviation and Space Museum in Ontario, and a third, which is privately owned, is held by New Zealand-based film director Peter Jackson.